In addition to adjusting the Frequency, Phase, Scale and Lag of the wavelets, you can also configure the view settings for the wavelet preview window based on your preferences. From the Control Panel, open the Wavelet tab. Click on an existing wavelet field or create a new wavelet field (see Creating a Wavelet Field). In the Details Panel, right click on the wavelet preview window and select Configure Track. The Configure Track window will be displayed. Title — Type a title for the wavelet. Y-Axis — Type the range of values to be displayed on the Y-axis. In this example, these are the TWT ms values. X-Axis — Define the amplitude range for the curves on the X-axis, enable the Auto Fit Range check box to automatically set the values based on the range of the curve. 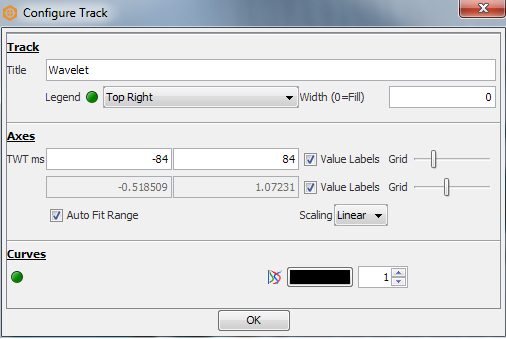 Value Labels — Select this check box to display the values on the X or Y axis of the tracks. Grid — Move the slider to the right to increase the number of horizontal or vertical grid lines in the track. Scaling — Select Linear or Log to display the curves in the wavelet in the linear or log axis space, respectively. The Curves section lists all the curves that are available for display in the track. Click the green/amber circle to hide/display the curves in the track. You can select to display the curve in line or filled gradient colours. Click the Show curve as lines or filled icons to change the display of the curve to line or filled gradient colours. Colourbar — For a line curve, you can change the line colour and opacity. Click the colour box and select the colour of your choice. Open the Select Colour window for more colour options and adjust the opacity. For a curve displayed in filled gradient colours, you can select the colour bar to be used. Click the Fill from left or right arrow to display the curve in filled colours from the left or right direction. Line Thickness — Type or select the line thickness of the line curve. Tip: To reset the wavelet view to display the entire wavelet, right click on the wavelet preview window and select Zoom to Fit.